The impacts of climate changes to cities, which are home to over half of the world´s population, are already being felt. In many cases, the intensive speed with which urban centres have been growing means that little attention has been paid to the role played by climatic factors in maintaining the quality of life. Among the negative consequences of rapid city growth is the expansion of the problems posed by urban heat islands, defined as areas in a city that are much warmer than in other sites, especially in comparison with rural areas. This paper analyses the consistency of the UHI related literature in three stages: first it outlines its characteristics and impacts in a wide variety of cities around the world, which poses pressures to public health in many different countries. Then it introduces strategies which may be employed in order to reduce its effects, and finally, it analyses available tools to systematize the initial high-level assessment of the phenomenon for multidisciplinary teams involved in the urban planning process. The analysis of the literature on the characteristics, impacts, strategies and digital tools to assess on the UHI, reveals the wide variety of parameters, methods, tools and strategies analysed and suggested in the different studies, which does not always allow to compare or standardize the diagnosis or solutions. ADAPT. Green spaces and corridors in urban areas. European Climate Adaptation Platform, 2015. Available online at: http://climate-adapt.eea.europa.eu/viewmeasure?ace_measure_id=4702. BARRIOPEDRO, D.; FISCHER, E..; LUTERBACHER, J.; TRIGO, R.M. ; GARCIA-HERRERA, R. The hot summer of 2010: Redrawing the temperature record map of Europe. Science 332 (6026), 2011. 220–224. BORBORA, J.; DAS, AK. Summertime Urban Heat Island study for Guwahati City, India. In Sustainable Cities and Society Sustainable Cities and Society, Vol. 11, 2014. 61–66. http://dx.doi.org/10.1016/j.scs.2013.12.001. CHOW, W.T.L. ; BRENNAN, D.; BRAZEL, A.J. Urban heat island research in Phoenix, Arizona: Theoretical Contribution and Policy Applications. Bulletin of the American Meteorological Society, Vol. 93(4), 2012. 517–530. http://journals.ametsoc.org/doi/pdf/10.1175/BAMS-D-11-00011.1. CITY OF FREIBURG. Land Use Plan 2020 of the city of Freiburg. 2013. http://planning.cityenergy.org.za /index.php/world-cities/europe/city-of-freiburg-germany [Not accessible now]. COMMISSION DE SANTÉ ET DE LA SÉCURITÉ AU TRAVAIL DU QUÉBEC (CSST) Guide de prévention des coups de chaleur. 2004. 19. COOLING SINGAPORE. A catalogue of strategies to mitigate Urban Heat Island and improve outdoor thermal comfort for tropical climate. 2017. https://www.coolingsingapore.sg/news-1/ [Accessed October the 5th, 2017]. CUEVAS, S.C. Climate change, vulnerability, and risk linkages. In International Journal of Climate Change Strategies and Management, Vol. 3(1), 2011. 29-60. DEBBAGE, N.; SHEPHERD, J.M. The urban heat island effect and city contiguity. Computers, Environment and Urban Systems, Vol. 54, 2015. 181–194. http://dx.doi.org/10.1016/j.compenvurbsys.2015.08.002. DÉOUX, S.; DÉOUX, P. Guide de l'Habitat Sain. Medieco Editions, 2004. 537. ECHEVARRIA ICAZA, L.; VAN DER HOEVEN, F. Regionalist Principles to Reduce the Urban Heat Island Effect. In Sustainability, Vol. 9(5), 2017. 677. ECHEVARRIA ICAZA, L.; VAN DER HOEVEN, F.; VAN DEN DOBBELSTEEN, A. Surface thermal analysis of North Brabant cities and neighborhoods during heat waves. TeMA J. Land Use Mobil. Environ, 2016b 9. In press. http://dx.doi.org/10.6092/1970-9870/3741. 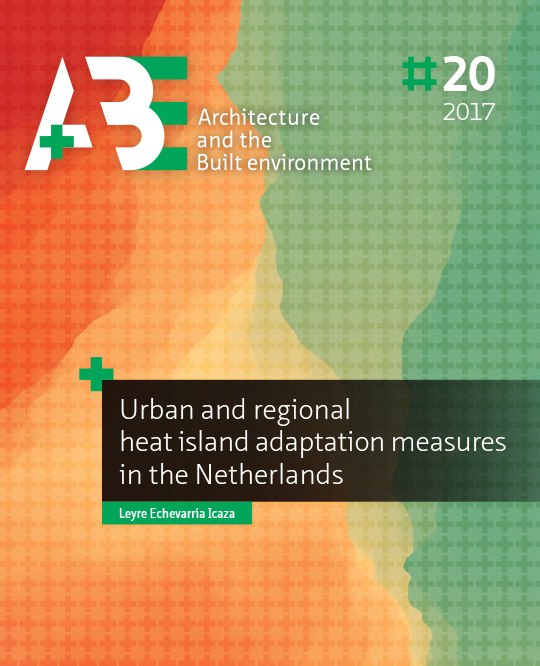 ECHEVARRIA ICAZA, L.; VAN DEN DOBBELSTEEN, A.; VAN DER HOEVEN, F. Integrating Urban Heat Assessment in Urban Plans. In Sustainability, Vol. 8, 2016d. 320. http://www.mdpi.com/2071-1050/8/4/320. EUROPEAN ENVIRONMENT AGENCY (EEA). Urban adaptation to climate change in Europe (Challenges and opportunities for cities together with supportive national and European policies). 2012. http://www.environment-agency.gov.uk/research/planning/127387.aspx. EMMANUEL, R.; KRÜGER, E. Urban heat island and its impact on climate change resilience in a shrinking city: The case of Glasgow, UK. In Building and Environment, Vol. 53, 2012. 137–149. http://dx.doi.org/10.1016/j.buildenv.2012.01.020. FUJIBE, F. Urban warming in Japanese cities and its relation to climate change monitoring. In International Journal of Climatology, Vol. 31(2), 2011. 162–173. http://onlinelibrary.wiley.com/doi/ 10.1002/joc.2142/epdf. GAGO, E.J. et al. The city and urban heat islands: A review of strategies to mitigate adverse effects. In Renewable and Sustainable Energy Reviews, Vol. 25, 2013. 749–758. http://dx.doi.org/10.1016/j.rser.2013.05.057. GIGUÈRE, M.; DUBÉ, N.; COLAS, J. Urban Heat Island Mitigation Strategies. Institut National de Santé Publique du Quebec, 2009. https://www.inspq.qc.ca/pdf/publications/1513_UrbanHeatIslandMitigationStrategies. pdf [Accessed October the 5th, 2017]. HATCHETT, B.J. et al. Assimilating urban heat island effects into climate projections. In Journal of Arid Environments, Vol. 128, 2016. 59–64. http://linkinghub.elsevier.com/retrieve/pii/S0140196316300076. HEBBERT, M.; WEBB, B. Towards a Liveable Urban Climate: Lessons from Stuttgart. In Liveable Cities: Urbanising World, Wuhan, China, ISOCARP, 2011. HENDEL, M.; GUTIERREZ, P.; ROYON, L. Measuring the Effects of UHI Mitigation in the Field: Application to the Case of Pavement-Watering in Paris. In Urban Climate, Vol. 16 (under review), 2016. 43–58. http://dx.doi.org/10.1016/j.uclim.2016.02.003. HOVE, LWA. ; STEENEVELD, GJ. ; JACOBS, C.M.J. ; HEUSINKVELD, B.G. ; ELBERS, J.A. ; MOORS, E.J. ; HOLTSLAG, A.A.M. Exploring the urban heat island intensity of Dutch cities. Alterra report 2170. Wageningen, Netherlands, 2011. HSIEH, C. M.; ARAMAKI, T.; HANAKI, K. (2007). Estimation of heat rejection based on the air conditioner use time and its mitigation from buildings in Taipei City. In Building and Environment, Vol. 42, 2007. 3125–3137. INTERGOVERNMENTAL PANEL ON CLIMATE CHANGE (IPCC). Climate Change 2001: The Scientific Basis. Chapter 2.2 How Much is the World Warming?. Geneva, 2001. KERAMITSOGLOU, I.; SISMANIDIS, P.; ANALITIS, A.; BUTLER, T.; FOUNDA, D.; GIANNAKOPOULOS, C.; GIANNATOU, E.; KARALI, A.; KATSOUYANNI, K.; KENDROVSKI, V.; LEMESIOS, G.; MYRIVILI, E.; ORDOÑEZ, D.; VAROTSOS, K. V.; VLASTOU, G.; KIRANOUDIS, C.T. Urban thermal risk reduction: Developing and implementing specifically explicit services for resilient cities. In Sustainable Cities and Society, 2017. https://doi. KERSHAW, T. et al. Estimation of the urban heat island for UK climate change projections. In Building Services Engineering Research and Technology, Vol. 31(3), 2010. 251–263. http://dx.doi.org/10.1177/0143624410365033. KIUILA, O.; WÓJTOWICZ, K.; ŻYLICZ, T.; KASEK, L. Economic and environmental effects of unilateral climate actions. In Mitigation and Adaptation Strategies for Global Change, Vol. 21 (2), 2016. 263–278. KLEEREKOPER, L.; VAN ESCH, M.; SALCEDO, T.B. How to make a city climate-proof, addressing the urban heat island effect. In Resources, Conservation and Recycling, Vol. 64, 2012. 30–38. http://dx.doi.org/10.1016/j.resconrec.2011.06.004. KOURTIDIS, K. et al. A study of the hourly variability of the urban heat island effect in the Greater Athens Area during summer. In Science of the Total Environment, Vol. 517, 2015. 162–177. http://dx.doi.org/10.1016/j.scitotenv.2015.02.062. LAUWAET, D. et al. Urban Climate Assessing the current and future urban heat island of Brussels. In Urban Climate, Vol. 15, 2016. 1–15. http://dx.doi.org/10.1016/j.uclim.2015.11.008. LEAL FILHO, W.; AZEITEIRO, U.; ALVES, F. (Eds) Climate Change and Health: Improving Resilience and Reducing Risks. Springer, Berlin, 2016. LEE, D.O. (1984) Urban climates, Progress in Physical Geography, Vol. 8, No. 1, 1984. 1–31. LUCID (The Development of a Local Urban Climate Model and its Application to the Intelligent Design of Cities). Development of a Local Urban Climate Model and its Application to the Intelligent Design of Cities. http://www.homepages.ucl.ac.uk/~ucftiha/[Accessed June 30, 2016]. http://www.arcc-network.org.uk/wp-content/pdfs/ACN-LUCID1.pdf [Accessed October 3rd, 2017]. LI, D.; BOU-ZEID, E. Synergistic interactions between urban heat islands and heat waves: the impact in cities is larger than the sum of its parts. In Journal of Applied Meteorology and Climatology, Vol. 52, 2013. 2051–2064. LI, D.; SUN, T.; MAOFENG, L.; YANG, L.; WANG, L.; GAO, Z. Contrasting responses of urban and rural surface energy budgets to heat waves explain synergies between urban heat islands and heat waves. In Environmental Research Letters, Vol. 10, 54009, 2015. 1-10. MECHLER, R.; HOCHRAINER, S.; AACHEIM, A.; SALEN, H.; WREFORD, A. Modelling economic impacts and adaptation to extreme events: Insights from European case studies. In Mitigation and Adaptation Strategies for Global Change, Vol. 15 (7), 2010. 737–762. MILLS, D.; SCHWARTZ, J.; LEE, M.; SAROFIM, M.; JONES, R.; LAWSON, M.; DUCKWORTH, M.; DECK, L. Climate change impacts on extreme temperature mortality in select metropolitan areas in the United States. In Climatic Change, Vol. 131 (1), 2015. 83–95. MORRIS, K.I. et al. Computational study of urban heat island of Putrajaya, Malaysia. In Sustainable Cities and Society, Vol. 19, 2015. 359–372. http://dx.doi.org/10.1016/j.scs.2015.04.010. MORENO-GARCIA, M.C. Intensity and form of the urban heat island in Barcelona. In International Journal of Climatology, Vol. 14 (6), 1994. 705–710. DOI:10.1002/joc.3370140609. NATIONAL GEOGRAPHIC. Urban heat island. Education Encyclopedia, 2016. http://education.nationalgeographic.org/encyclopedia/urban-heat-island/. NURUZZAMAN, M. Urban Heat Island: Causes, Effects and Mitigation Measures - A Review. In International Journal of Environmental Monitoring and Analysis, Vol. 3(2), 2015. 67. http://www.sciencepublishinggroup.com/journal/paperinfo.aspx?journalid=162&doi=10.11648/j.ijema.20150302.15. OKE, T.R. Boundary Layer Climates. 2nd ed. ; Routledge Press: New York, NY, USA, 1987. PÉTI, M. Re-understanding Sustainability on Regional Level. The Role of Impact Assessment in Transitioning to the Green Economy, 30th Annual Meeting of the International Association for Impact Assessment. International Conference Center Geneva, Switzerland, 2010. RAYMOND, E.L.; BOUCHARD, A.; GAGNON, V. La gestion du risque de chaleur accablante ou extrême dans l’agglomération de Montréal. Centre de sécurité civile, Ville de Montréal, 2006. 18. ROSENZWEIG, C.; SOLECKI, W.D. ; HAMMER, S.A.; MEHROTRA, S. Climate Change and Cities (First Assessment Report of the Urban Climate Change Research Network). United States of America by Cambridge University Press, New York, Cambridge University Press, 2011. ROTEM-MINDALI, O. et al. The role of local land-use on the urban heat island effect of Tel Aviv as assessed from satellite remote sensing. In Applied Geography, Applied Geography Vol. 56, 2015. 145–153. http://dx.doi.org/10.1016/j.apgeog.2014.11.023. SAILOR, D.J. ; DIETSCH, N. The urban heat island mitigation impact screening tool (MIST). In Environmental Modelling and Software, Vol. 22, 2007. 1529-1541. SANTAMOURIS, M. Heat Island research in Europe – the state of the art. 2007.Journal Advances Building Energy Research, Vol. 1, 2007. 123–150. SANTAMOURIS, M. Using cool pavements as a mitigation strategy to fight urban heat island - A review of the actual developments. In Renewable and Sustainable Energy Reviews, Vol. 26, 2013. 224–240. http://dx.doi.org/10.1016/j.rser.2013.05.047. SANTAMOURIS, M.; PARAPONIARIS, K.; MIHALAKAKOU, G. Estimating the ecological footprint of the heat island effect over Athens, Greece. In Climatic Change, Vol. 80(3-4), 2007. 265–276. http://link.springer.com/article/10.1007%2Fs10584-006-9128-0. SOLECKI, W.; ROSENZWEIG, C.; PARSHALL, L.; POPE, G.; CLARK, M.; COX, J.; WIENCKE, M. Mitigation of the heat island effect in urban New Jersey. In Environmental Hazards, Vol. 6, 2005. 39-49. TAKEBAYASHI, H.; MORIYAMA, M. Surface heat budget on green roof and high reflection roof for mitigation of urban heat island. In Building and Environment, Vol. 42(8), 2007. 2971–2979. http://www.sciencedirect.com/science/article/pii/S0360132306001752. TAYLOR, A. Institutional inertia in a changing climate: Climate adaptation planning in Cape Town, South Africa. In International Journal of Climate Change Strategies and Management, Vol. 8(2), 2016. 194-211. UNITED NATIONS (UN). Goal 11: Make cities inclusive, safe, resilient and sustainable. 2016. http://www.un.org/sustainabledevelopment/cities/ [Accessed April 20, 2016]. UNITED NATIONS (UN). World Urbanisation Prospects: The 2014 Revision (Highlights). Department of Economic and Social Affairs, New York, 2014. http://esa.un.org/unpd/wup/Highlights/WUP2014-Highlights.pdf. UNIVERSITY COLLEGE LONDON (UCL). London Unified Model. Presentation by M. Davies, 2012. UNITED STATES CENTRES OF DISEASE CONTROL AND PREVENTION (US CDC) Climate Change and Extreme Heat Events. Atlanta, Ga, US, 2012. UNITED STATES ENVIRONMENTAL PROTECTION AGENCY (US EPA). Adapting to Heat. 2015. https://www.epa.gov/heat-islands/adapting-heat#forecasting [Accessed April 16, 2016]. UNITED STATES ENVIRONMENTAL PROTECTION AGENCY (US EPA). Heat Island Effect. 2016. https://www.epa.gov/heat-islands [Accessed April 16, 2016]. UNITED STATES ENVIRONMENTAL PROTECTION AGENCY (US EPA). Heat Island Impacts. 2015. https://www.epa.gov/heat-islands/heat-island-impacts [Accessed April 16, 2016]. UNIVERSITY CORPORATION FOR ATMOSPHERIC RESEARCH (UCAR). Urban Heat Islands. UCAR. 2011. http://scied.ucar.edu/longcontent/urban-heat-islands [Accessed April 16, 2016]. VIENNA UNIVERSITY OF TECHNOLOGY. Development and Application of Mitigation and Adaptation Strategies and Measures for Counteracting the Global Urban Heat Islands Phenomenon. TU Wien. Technische Universität Wien, Vienna. (3CE292P3). ERDF UHI project. Workpackage 5. Catalogue of M&A strategies. 2014. http://www.central2013.eu/fileadmin/user_upload/Downloads/outputlib/UHI_Catalogue_of_Mitigation_and_Adaptation_strategies.pdf. [Accessed October the 5th, 2017]. WEN, Y.; LIAN, Z. Influence of air conditioners utilization on urban thermal Environment. In Applied Thermal Engineering, Vol. 29, 2009. 670–675. YAMAMOTO, Y. (2006). Measures to Mitigate Urban Heat Islands. In Quarterly Review, n°18, January 2006. Environment and Energy Research Unit, Science and Technology Foresight Center, Japan. https://www.coolrooftoolkit.org/wp-content/uploads/2012/04/Measures-to-Mitigate-UHI-Yamamoto.pdf. [Accessed October the 5th, 2017]. ZHAO, L. et al. Strong contributions of local background climate to urban heat islands. In Nature, Vol. 511(7508), 2014. 216–219. http://dx.doi.org/10.1038/nature13462. LEAL FILHO, Walter et al. Impacts, strategies and tools to mitigate UHI. A+BE | Architecture and the Built Environment, [S.l. ], n. 20, p. 67-102, dec. 2018. ISSN 2214-7233. Available at: <https://journals.open.tudelft.nl/index.php/abe/article/view/3462>. Date accessed: 26 apr. 2019. doi: https://doi.org/10.7480/abe.2017.20.3462.